In the Start Menu of Windows 7 and Windows Vista, on the right pane, there are plenty of shortcuts to system folders and personal user shell folders such as Documents, Pictures, Music, Games, Computer, Network and Connect To. If you’re not using these folders and do not need easy shortcut access to these folders from Start Menu, you can remove any or all of the folders from Start Menu of Windows Vista and Windows 7. Right-click Start, and then click Properties. Or, if the Start Menu is already displayed, right-click an empty area of the Start Menu, and then click Properties. In the “Taskbar and Start Menu Properties” dialog window, make sure that you’re at “Start Menu” tab. Else click on Start Menu tab. Click on Customize button for the Start Menu. The Classic Start Menu does not have the folder shortcuts on right pane of Start Menu feature. In the “Customize Start Menu” dialog, uncheck and untick the check box for folders that you doesn’t want to appear in Start Menu. Folders that can be removed and hidden from Start Menu by unselecting check box include Connect To, Default Programs, Favorites Menu, Help, Network, Printers and Run Command. For Computer, Control Panel, Documents, Games, Music, Pictures, System Administrative Tools and Personal Folder (container folder with logged on user name as folder name), click on Don’t display this item radio button individually instead to remove the folder from Start Menu. The Start Menu will immediately reflect the change and remove the folders unselected from Start menu so that the folder is no longer displayed on the Start menu. Note that removing the folders from the Start menu does not remove the files stored in the target location of the folders affected. 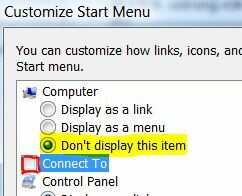 To restore the folders into Start Menu, simply tick back the check box or select either “Display as a link” or Display as a menu” option.